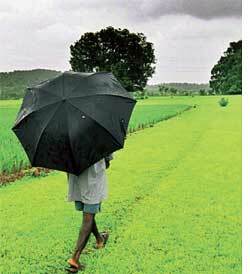 THE monsoon winds are avoiding India for one-third of the months of July and August and taking a route south of its peninsula. This is because the winds have found a highly attractive low pressure region in the eastern part of the Indian Ocean near the equator. According to a study, warming of the sea surface in this region is happening at a faster rate than the Arabian Sea and Bay of Bengal and has contributed to this intensification of low pressure. Monsoon in India starts around the end of June when the moisture carrying southwesterly winds from the Arabian Sea are drawn towards the intense low pressure region over the Bay of Bengal and on their way pass over most parts of the subcontinent bringing rain. As the new low pressure region in the eastern Indian Ocean intensified over the last 50 years, the monsoon winds started turning towards this region. In the process they passed south of the Indian peninsula thus avoiding it. This is called a break in the monsoon period. The breaks could be short or long. Prolonged breaks in the monsoon can create drought conditions all over the country like the one caused in 2002 by a 34-day break in the monsoons. The researchers, from the National Institute of Oceanography at Goa, India found that between 1950 and 2007, the long breaks in monsoons increased from 16 per cent to 32 per cent and the periods coincided with intensification of low pressure over the eastern Indian Ocean. Drawing from previous studies on warming of the sea surface in this part of the Indian Ocean, they found that while the temperatures of the part of the Indian Ocean near the equator former rose around 0.75 degree centigrade, that of the Bay of Bengal and Arabian Sea rose around 0.4 degree centigrade. Rates of increase of sea surface temperature matched the rates of change in wind speed. When the low pressure is intense, the speed with which the winds move to the low pressure region is higher. This led the researchers to conclude that rise in sea surface temperature in this region contributed to the intensification of low pressure. The study was published in the April 2 issue of ieee Geoscience and Remote Sensing Letters. However, the reason why the sea surface in the Indian ocean is warming faster than the Bay of Bengal or the Arabian Sea is not clear and requires further studies. According to M R Ramesh Kumar, lead author of the paper and a scientist with the National Institute of Oceanography, it could be because this region receives more rainfall. "The fresh water which falls on these regions absorbs more incoming solar radiation than the saline water," he explained. "The speed of the Tropical Easterly Jet Stream (a wind stream that forms over Southern Asia and East Africa during the summer months and affects the formation of Indian monsoons) decreased in the last 50 years. The number of depressions over the Bay of Bengal have also decreased. The low pressure system over the Bay of Bengal is one of the main rain generating mechanisms for central and northern parts of India," said Kumar.